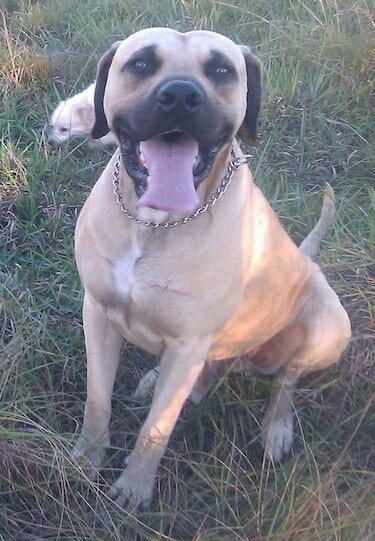 Duke the Boerboel at 1 year old—"Duke is a 1 year old male Boerboel. He loves cats but does not do well with smaller dogs. I have gotten him to finally walk at least with small dogs but have not left him unattended. I watch Cesar Millans programs and that has helped me tremendously with his walking and behaviour. The thing Duke loves the most is when we get him big cow bones to chew on. Duke is a great protector of the family and of my sisters 1year old son. 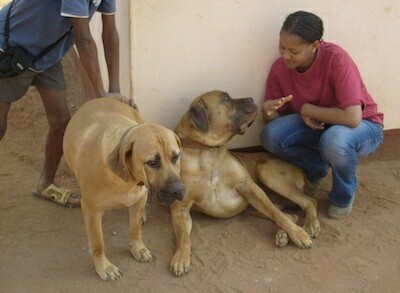 Boerboels are great family pets and easy going and live up to their great names. The thing that I think is really funny is that my small cat chases him around the yard instead of him chasing the cat. This provides hours of entertainment. I exercise Duke twice a day. A walk when i get home from school and a late afternoon ride on the bicycle so he can run all his energy out, well almost." 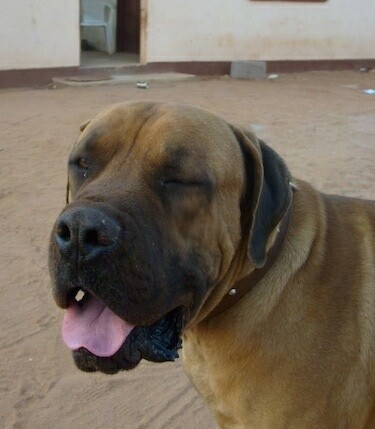 The Boerboel is a big, strong and intelligent working dog. It is well balanced with good muscle development and buoyant in movement. 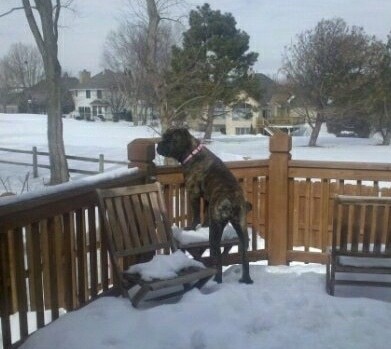 The dog should be impressive and imposing. Male dogs appear noticeably masculine and females feminine. All parts of the body should be in proportion with each other. 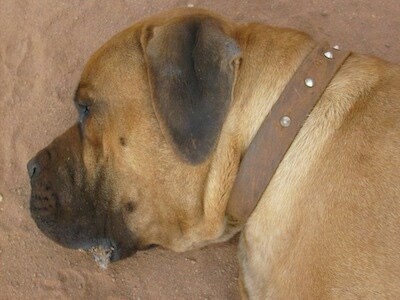 The head is the most important feature of the Boerboel, as it represents its total character. It is short, broad, deep, square and muscular with well filled cheeks. The part between the eyes must be well filled. The top of the head is broad and flat, with prominent muscle development. The face should blend symmetrically with the head, and can be with or without a black mask. The stop should be visible, but not prominent. The muzzle is black with large nostrils which are widely spaced. The nasal bone is straight and parallel to the topline of the head which is deep, broad and tapers slightly to the front. The nasal bone should be 8-10 cm long. The loose, fleshy upper lip should cover the lower lip, but should not hang lower than the lower jaw. The jaws (mandibles) are strong, deep and broad, and narrow slightly to the front. The teeth should be white, well developed, correctly spaced, with a complete set of 42 teeth and a scissors bite. The broad, horizontally set eyes are any shade of brown, but darker then the pelt, with firm, well-pigmented eyelids. The ears should be of medium size, V-shaped and should be in proportion to the head. They are set fairly high and wide against the head. When the dog is alert, the ears should form a straight line with the top of the head. The neck shows a noticeable muscle curve, and is attached high at the shoulder. 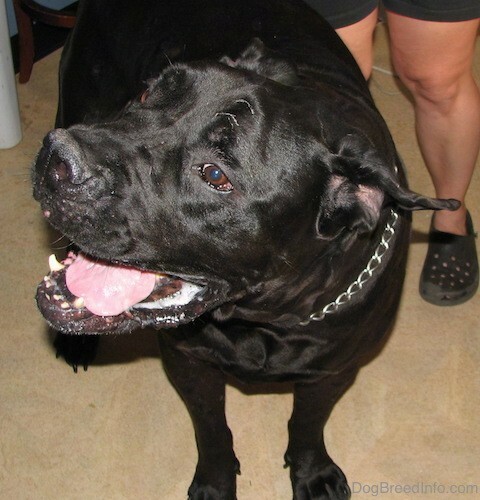 The strong, muscular neck is of medium length and in proportion to the rest of the dog. The skin of the neck is loose under the throat and becomes taut between the front legs. The body narrows slightly toward the loin. The topline should be straight. The back is straight, broad and in proportion, with prominent back muscles and a short loin. The rump is broad and strong, with good muscle development. The chest is muscular, broad and strong. The straight, short tail is attached high to the body. The front legs should be perfectly vertical. The hind paws are slightly smaller than the front paws. The big, well-padded paws are rounded with dark curved toenails. The paws should point straight forward. Dewclaws should be removed. The skin is thick, loose, well pigmented with moderate wrinkles on the forehead when the dog is alert. The short, dense, sleek coat comes in cream white, pale tawny, black, reddish brown, brown and all shades of brindle. 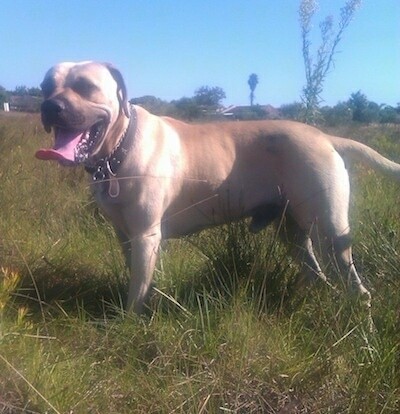 The development of the Boerboel can rightfully be described as a true South African success story and is today a beacon for those who have made a contribution to improve the breed. The refining of the breed is still on the developing stage. 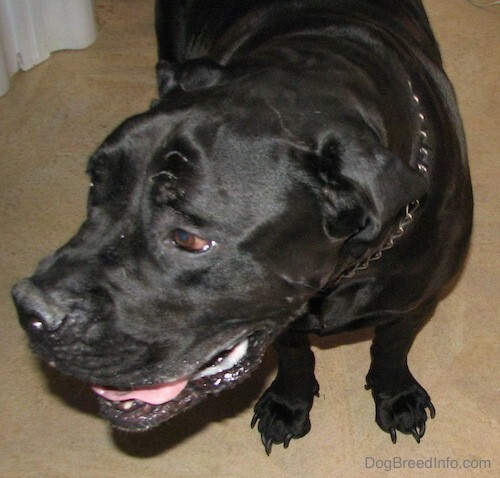 Much has already been written on the descent of the Boerboel but nobody can state with certainty that it is bred from one, two or more breeds of dogs. What is confirmed by investigation is that Jan van Riebeeck brought with him a "bullenbijter" on his arrival to the Cape. 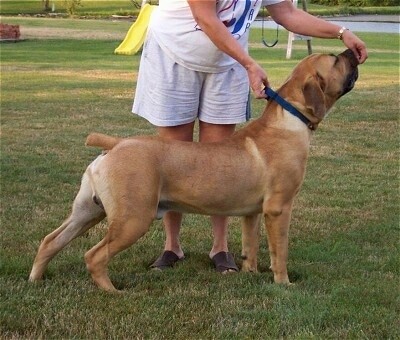 This dog was a large strong breed which reminded one of the Mastiff type of dog. Those who followed Van Riebeeck to the Cape had also brought with them only the largest and strongest dogs and over a period of decades only the strongest survived in the now desolate country. With the arrival of the British Settlers in 1820 they brought amongst others the Bulldog and Mastiff type of dog. 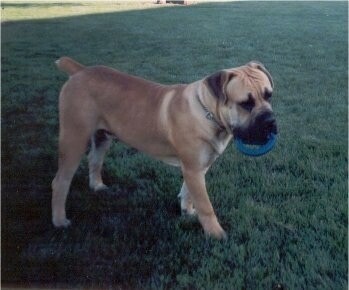 (In 1938 the real Bull Mastiff was imported to South Africa by De Beers to guard the diamond mines.) It is also known that they imported a champion obtained from the Hottentots, who played a role in the development of the Boerboel. The "Boerdogs" (as they are known) were scattered by the Voortrekkers during the Great Trek and they continued to breed with them. According to tradition, after the Anglo Boer War in 1902, these dogs were cross-bred with the English long-legged Bulldog and also with the Bull Mastiff in the late and early 1950s. The history is especially known among the farmers of the North-Eastern Free State, Northern Natal and in parts of Transvaal. 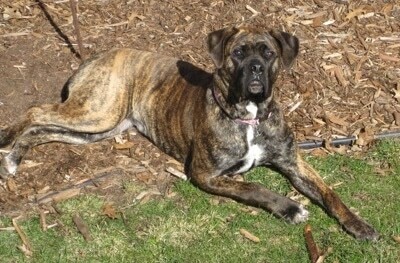 Otis, an African Boerboel at 2 years old, weighing 150 lbs., "He loves to lounge on the kids’ swing set." 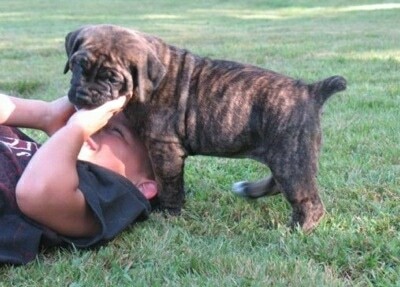 Bolt the Boerboel puppy at 5 weeks old—"Bolt is a purebred Boerboel who is warm and lovely." 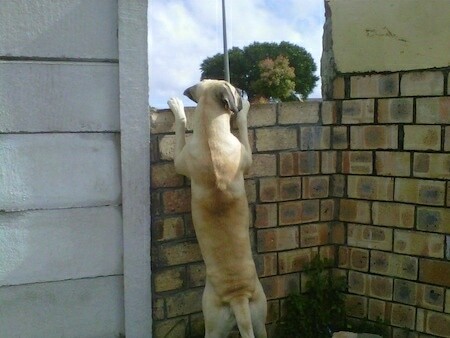 "Our purebred Boerboel dog called Nahu—Nahu is a Maori name meaning protector (from New Zealand). Nahu was imported from South Africa at 8 weeks of age. 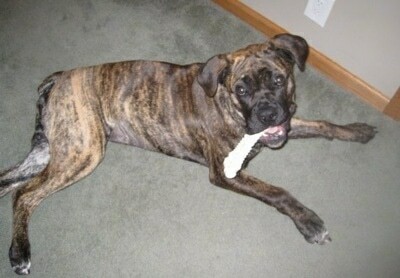 He was 7 months old at the time of this picture and 120 pounds. He will grow to about 180-200 pounds based on the other males from the breeder who we bought him from. He is extremely affectionate and very protective of me and my husband. He’s wary of strangers but as soon as he knows that we’re comfortable with new people he’s OK with them, too…. He has a 6th sense and can tell if people are good or not. The breed seems to be very instinctive, picking up on owner’s feelings, if we’re nervous or wary of someone they are, too. We live in an apartment and he gets along really well with our two Burmese cats. We crate-trained him when he was young so he sleeps and eats in his crate, but the rest of the time he’s free in the home. He’s responding very well to dog training; he’s the best in his class. All he wants to do is be wherever we are, so he always sticks by our side when out walking. We feed him a totally raw food diet (i.e. raw turkey necks, whole raw chickens, raw steak, raw trout fish, pulped fruit and vegetables, almonds, walnuts, sunflower seeds, supplements like calcium, vitamin C, kelp, cod liver oil, flax seed oil, etc.) 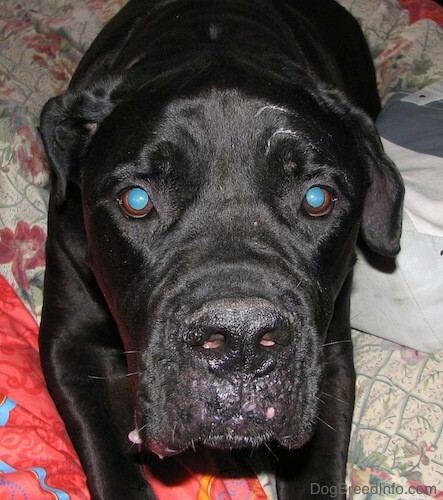 I’ve never seen a healthier dog and his recent blood tests came back better than perfect." 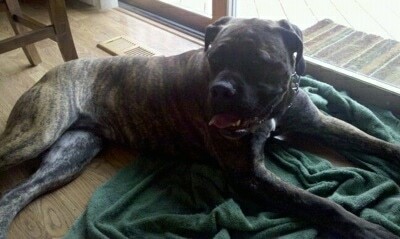 Jabari is 10 months old and 120 pounds in this photo. 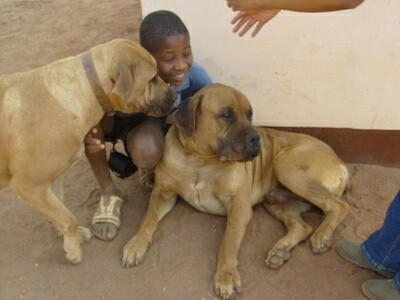 "Mia the South African Boerboel as a 10-month-old-puppy; at 13.5 months old she weighed 102 lbs. She is the sweetest, most loving dog. Very loyal—follows us around constantly. Protective at nighttime and will bark at strange sounds outside. Loves kids and other dogs. Looks forward to going to doggy daycare. Loves playing with tennis balls and chewing on Nylabones. Also loves rolling around and getting her tummy rubbed. Likes going on walks but is not good with the heat. Will lie down during the walk if too hot out. She drinks tons of water all day—and slobbers a lot! Feed her Blue Buffalo large breed chicken and brown rice, 3 cups in morning and 3 at night. Doesn't chew on anything inside that's not hers. When she was a puppy she liked to chew on the rubber part of our door stops!? Outside she'll chew on and eat ANYTHING! Dirt, branches, leaves, sticks, mulch, etc. Will drink out of the toilet if we forget to put the lid down! Doesn't mind her baths but hates getting her nails clipped. Monthly baths are adequate—unless it's been raining out and she's been digging in the mud! Clip her nails and clean out her ears twice a month. Sheds more during the spring/summer. Love their type of fur because isn't oily/greasy like some dogs. She is crate trained and stays in her kennel during the day when no one is home. At night she sleeps on her bed in our room. Not allowed in our bed! 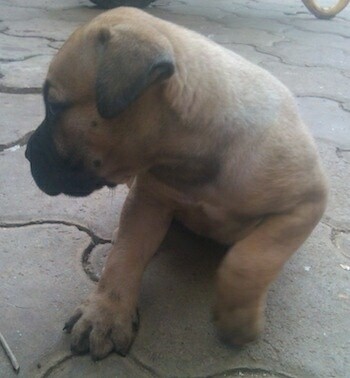 We will definitely be getting another Boerboel in the near future. 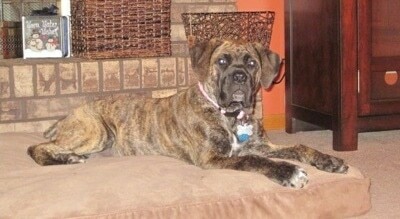 We just love her personality, temperament and build. Everywhere I take her people ask what breed she is and everyone at the vet tells me they'll take her if I ever wanna give her up!"